Sgt. Benjamin S. Hines (left) and Staff Sgt. Christopher K.A. Slutman. 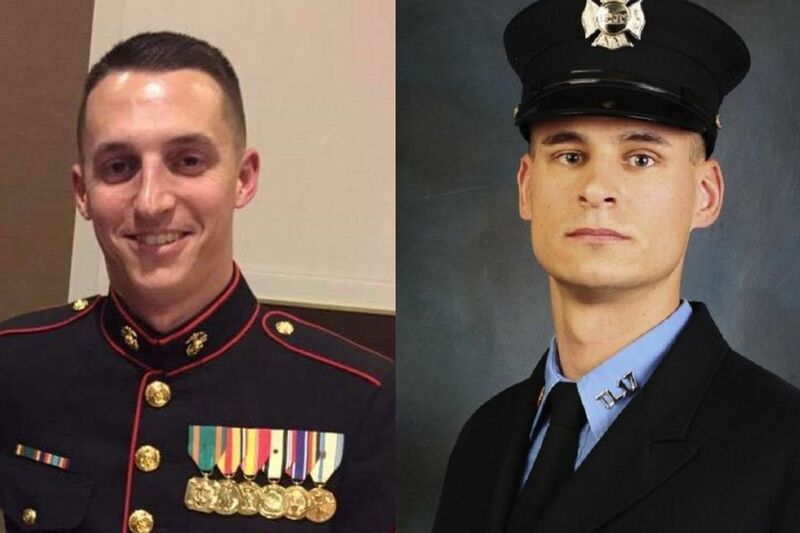 A Marine from York, Pa., and another from Newark, Del., were among three killed in an attack Monday in Afghanistan, the Defense Department announced. Sgt. Benjamin S. Hines, 31, of York, and Staff Sgt. Christopher K.A. Slutman, 43, of Newark, along with Cpl. Robert A. Hendriks, 25, of Locust Valley, N.Y., died while conducting combat operations in Parwan province, the department said Tuesday. “Our focus in the wake of this attack is to support the family, friends, and loved ones of our fallen Marines,” Maj. Roger Hollenbeck, a public affairs officer, said in a statement. The Associated Press said the Marines were killed in a roadside bombing of an American convoy near Bagram Airfield, the main U.S. base in Afghanistan. The Taliban has claimed responsibility for the attack. Stars and Stripes reported that three other Americans were injured, along with an Afghan contractor and five Afghan civilians. Hines and Slutman were assigned to E Company, Second Battalion, 25th Marine Regiment, Fourth Marine Division, Marines Forces Reserve in Harrisburg. Both were expected to return home this month from their deployments, Kyle Moyer, a friend and Marine veteran, told Stars and Stripes. The three Marines were part of a deployment that started in the Republic of Georgia to train and advise troops there and then serve with them in Afghanistan. Hines graduated in 2006 from Dallastown Area High School, southeast of York. The school district acknowledged his death in a tweet posted Tuesday. “The Wildcat Nation mourns the loss of Benjamin Hines, Class of 2006, one of three Marines killed in Afghanistan yesterday. We send our deepest sympathy and condolences to his parents, family, friends, and fellow Marines,” the school district said. The Wildcat Nation mourns the loss of Benjamin Hines, Class of 2006, one of three Marines killed in Afghanistan yesterday. We send our deepest sympathy and condolences to his parents, family, friends, and fellow Marines. Hines joined the Marines in 2006 and served in Operation Iraqi Freedom from Sept. 7, 2008, until April 1, 2009. Slutman, while maintaining his family’s home in Delaware, was a New York City firefighter assigned to Ladder 27 in the Bronx. The department said he is survived by his wife and three daughters. Slutman also served in Iraq and was deployed for a month in 2010 in Mozambique. Hendriks was assigned to Weapons Company, Second Battalion, 25th Marine Regiment, Fourth Marine Division, Marine Forces Reserve in Garden City, N.Y.